The Penguins are now one win away. Pittsburgh now has a 3-1 lead in the Stanley Cup Final and once again, they did it by taking an early lead. Through four games, the Sharks have not led for a single second in the series, with their only win coming on a sudden-death goal in overtime. On Monday, the Penguins took the lead mid-way through the first when the Sharks got caught in a line change and all their skaters got caught on the wrong side of the ice. 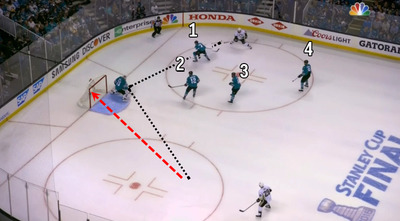 With the Sharks keying on Phil Kessel on the right side, his shot rebounded to the left where Ian Cole slammed home a shot into the wide-open net. It was 1-0 and the Pens never looked back, winning 3-1. The Royals scored a run on a painful error. The Orioles attempted to turn an inning-ending double-play in the seventh inning of a 0-0 game with the Royals. However, second baseman Jonathan Schoop had his throw bounce off the arm of Cheslor Cuthbert as he was sliding into second. It is not unheard of for a fielder to throw low to force a runner out of the way on these throws. However, that is not what happened here. Schoop appeared to be trying to stop his own throw and just lost the ball as he tried to stop. The ball went straight down and off the arm of Cuthbert. The Royals scored to take a 1-0 lead, but eventually lost 4-1. Charles Barkley’s baseball swing is not much better than his golf swing. Sir Charles took some hacks during batting practice prior to the Cubs-Phillies game. Barkley, who famously has one of the worst golf swings in the history of mankind, is not much better here. To be fair, at least this one looks like a single motion, but bat speed is not his friend. It wasn’t all bad for Barkley. He did make contact a couple of times, but when he did, the ball barely made it back to the mound.